A chimney liner is the material on the inside walls of your flue that keeps the combustion products that are flowing up your chimney from escaping into the chimney structure or even back into your house before they can be exhausted to the outside air. 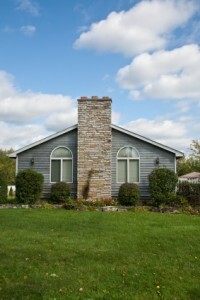 If you live in a house that was built before 1940, it is likely that your chimney does not have a built in liner. Early chimneys relied on the integrity of the bricks and mortar to keep flue gases inside the flue. This system works very well in a newly constructed chimney, but over time water damage, corrosive gases, and other forces will degrade the competence of the chimney structure and it will begin to crack, lose bricks, and leak flue gases. If you can see smoke wafting out between the bricks of your chimney along before it makes it out the top of the flue, you know you need a new chimney liner. Even if you don’t see a visible smoke problem, you should have your chimney inspected regularly and have appropriate repairs made to keep the flue working properly. If your chimney needs a liner, or, if the existing liner needs to be replaced, there are several different materials and methods of installation you can consider. New homes with brick or masonry chimneys almost always have a built in clay tile liner inside the flue. These liners will last several decades, but can become damaged over time. A new liner can be installed inside an unlined chimney, or inserted inside an existing liner, using clay tiles, special mortar, flexible metal, or rigid metal. Installing a mortar chimney liner involves pouring specially formulated cement into the chimney, surrounding a removable bladder or other tool which will leave a cylindrical flue in place once removed. Rigid metal chimney liners can be inserted into a chimney if the flue is not offset, meaning, it runs vertically from top to bottom without any bends. 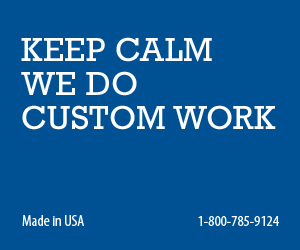 If your flue is offset, a flexible metal liner may be the best choice. 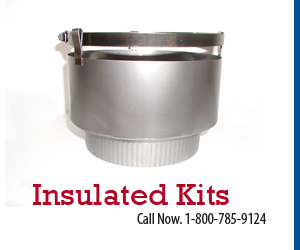 Flexible metal chimney liners are made of aluminum or several grades of stainless steel. The type of metal you choose will depend upon the application for which you need a chimney liner. 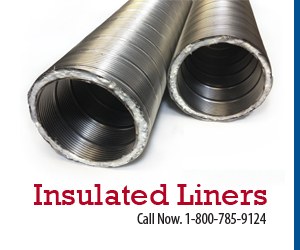 Flexible aluminum liners, such as the M-Flex Aluminum Chimney Liner, can be used to vent low efficiency gas appliances such as boilers and furnaces. A low efficiency appliance vents very hot flue gases, so condensation inside the flue is usually not an issue. For high efficiency appliances, you need to use a special stainless steel alloy flexible liner because the high efficiency appliance discharges relatively cool exhaust gases, condensation of corrosive water and other chemicals will occur inside the flue, so you need a highly corrosion resistant liner to avoid future problems. If you are installing a wood burning insert into your fireplace, you will need to choose a flexible stainless steel chimney liner that conforms to the insert manufacturer’s specifications.